I've gotten so many compliments on this rug. Absolutely love it. Its nutral tones are the perfect addition to our livingroom. great buy. 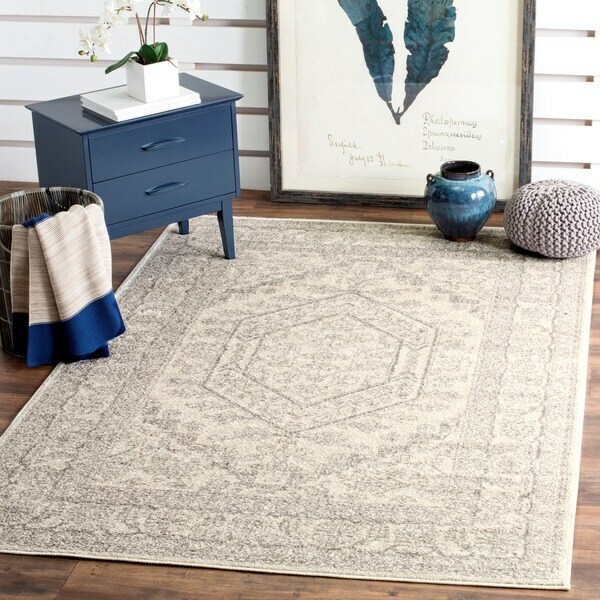 The perfect balance of traditional charm and modern sensibilities, this 8' x 10' rug from Safavieh's Adirondack Collection is a chic option for any style of home decor. Drawing inspiration from classic Oriental patterns, this neutral ivory and silver rug has a focal diamond medallion and a distinctive border. 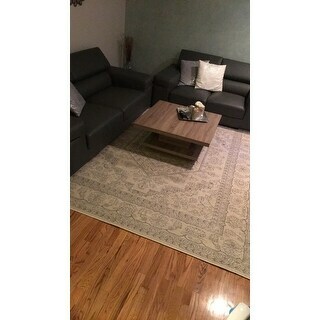 I like this Safavieh Adirondack Vintage Ivory and Silver rug the color in person is way better than the photo; this rug look like a high quality rug and it fit perfectly in the space and it was a great buy however, It on the thin side so use padding or place it in a non-traffic area. This rug was a great buy. 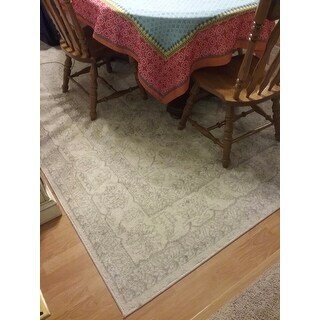 I absolutely love this 8x10 ' rug, it is light in color which is just what I was looking for. It is thin, but for my purpose in a low traffic area it is perfect, I am using without padding. The rug comes rolled, but by placing objects on corners it flattened out in one day. I would definitely recommend this rug to anyone looking for a light colored, low traffic area rug! Love it! 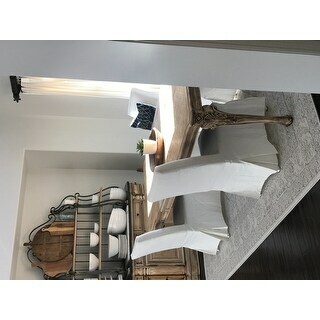 Perfect for my dining room with a perfect price! I looked for an area rug in the right shade of blue/aqua/turquoise and it's impossible to feel comfortable you'll end up with the color you need to match. This is for my dining room so ivory and silver seemed like a bad idea but I kept coming back to this because it would go with the new look I had. It is not thick and plush, it's not going to add cushion to a hard floor but for my needs it was perfect. Looks beautiful, reasonable price, cleans up well when the cat leaves a furball and nothing has fallen on it I couldn't clean up. I did roll it up and move it during a Bonfire when it was almost brand new and a lot of traffic was coming through but I've never done it since then. We've had it about 4 months and it's right by our entrance from the garage. For some reason my pictures give it a creamy color but it doesn't have a yellow tint to it. The product pictures look accurate to me. For the price the rug is great! It is beautiful. Also, love the height (thinness) of the rug. 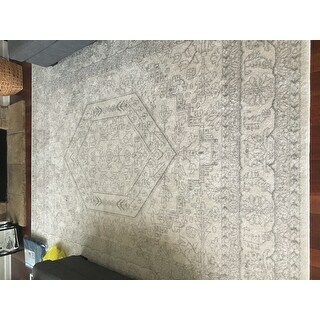 Only complaint - The description says the rug is ivory, however when I saw it in person it is much more of a silver-white color. This wasn't a huge surprise because we read the reviews beforehand. I bought the rug around Christmas, so I've had it about 3 months. It's exactly what I needed for the space-- neutral colors, but not at all boring, it goes with just about anything. I change my mind a lot when decorating and this rug keeps up. I also have two very large dogs ( one white and one brown) and it disguises the hair well! I vacuum at least 3 times a week and I haven't noticed the fibers coming out the way they have with previous rugs. I also have a two year old, and despite the light colors, it's managed to deflect popsicle, coffee, and milk though I have always cleaned spills up quickly. It's soft to the touch, though I recommend a thicker pad underneath it as it's not quite enough to cushion a toddler or infant tumble on its own. Overall, I'm very happy with the rug and have received several compliments on it since we've had it. I was a bit surprised when I first unrolled this area rug...it practically filled my living room it was so large. Once the furniture was placed on and around it, I was very pleased by how it "tied the room together." It is not a plush rug, but seems like it will wear well. I am using it without a rug pad and it also seems to lay flat enough and stay in place. However, we do not have pets or small children. If someone was running through the living room, a pad to hold the rug in place might be useful. The overall color and design is subtle, so it may blend well with a variety of decors. This rug is the perfect color for my bedroom - light and neutral but still with a beautiful print. The 8x10 size fits perfectly and it didn't stay curled up at the edges like most rugs do. The rug is so soft and feels amazing on your feet (especially if your hardwoods are cold in the mornings). I got this for a great price and would highly recommend it! Love this rug. Great color to decorate against. Beautiful classic rug. Has held up well with kids and frequent foot traffic despite light color. I would highly recommend! Love this rug! Can’t beat the price and it arrived in 3 days! This rug arrived exactly as described. The edges are slightly curled from being rolled up but I’ve got book stacks pressing them down. I love the print. It’s super soft on your feet. I was really nervous about ordering such a big item online but it was worth the risk. 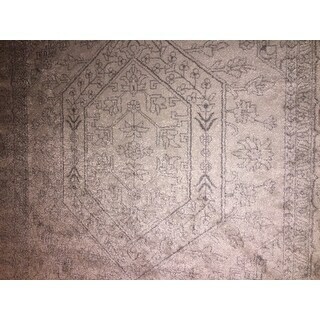 Very nice rug and very nice price. Hoping the wrinkles will fall out soon as it just came today. I would recommend and pad if going in a living room because it’s a little on the thin side. I really like the look of the rug. The light color really goes well with my dark furniture. The rug is on the thinner side but it’s still soft and wasn’t too wrinkled when we laid it out. It came packaged nicely. I would recommend it! This rug is amazing! Purchased for my sons bedroom, and he loves it! When I purchased this rug, I hoped it would be a nice addition to my bedroom. Whwn it came, I was so very pleased because it is even more beautiful than I’d hoped for. It’s not very thick, but it is soft and almost looks vintage. This is a great rug for the price! Don’t hesitate purchasing it. Looks nice, but is difficult to keep bumps out, even with a rug pad. Nice addition to our living room. Easily spot cleaned. Durable. No shedding that I've noticed. I just received my rug today and this looks really good. It looks greater that i thought. I have tiles in my house and this will cover my floor beautifully. The color matches with my furnitures and painting. I really love it. I am going to buy one more rug for my basement today. I am very happy with fast delivery and nice service. Looking to purchase more products and rugs from this website. Thank you so much! We love this rug! It was purchased to warm up a guest room (hardwood floors) and it really does. It hold up very well to the sweeper and foot traffic. The pictures on the web don’t do it justice, it’s nicer in person. Beautiful rug! Great pattern, feel, and price. Pleasantly surprised & exactly as pictured. I was a little skeptical ordering a rug online just because you never know what you’re going to get. Everyone compliments my rugs from overstock every time they come into my house. Can’t get over the price for the 2 8x10s I got! You can’t beat it! The rugs totally pull the rooms together and give it that character I was looking for. I think they both arrived 2 days after I ordered too! Great experience and have already recommended to friends & family! The rug looks as described. My only issue as which most people will have upon delivery is getting the rug to flatten out completely. I am sure over time and effort, this will be accomplished. I am pleased with the purchase with it being my first ever rug purchase as an adult. "Is it a true measurement of 8x10?" "Does this rug read more gray or ivory? Does it lean more towards white than cream? We're looking for a rug that will accent our "bedroom retreat" - dark wood floors, warm brown furniture, creamy walls, white bedding. But we need "warm", not "cool"." There is a lot of Ivory in it but it is subdued by the grey print. It is definitely well coordinated. There is no white or cream in it and we have it on the hardwood floor with creamy walls also. It just seems to brighten up the room tremendously. With the right padding it feels wonderful to walk on. 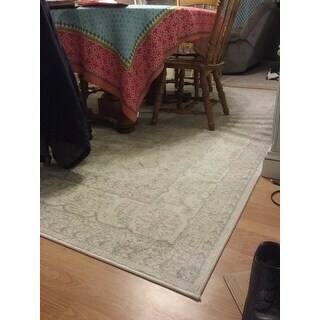 It says 8x10 on the bottom of the rug but is about 3 or so inches smaller on both the length and width. I just love it. Wonderful buy. My opinion, I would say it was "warm". Good luck. To me there is an equal combination of the grey and ivory. I would call the color cream, definitely not white. 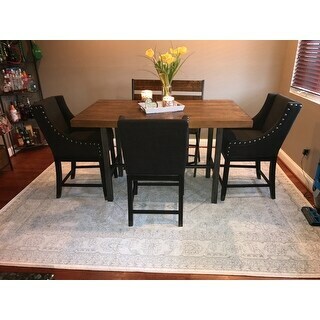 It took me more than a year to decide what rug to purchase for my dining room, and I couldn't be happier. Since I am using it for my dining room, I have not needed a padding which saved even more money. The rug was a perfect purchase for my needs. I would say it equal amounts of gray and ivory....the gray is a light gray so it looks like it is more ivory. I have tan colored furniture and cherry floors and it looks good, but not sure how it would go with the White bedding. The rug is beautiful but it is more ivory/cream and not white. "How do you clean this rug? Can you steam clean?" "How crisp is the design on this rug? In some photos it looks muddy and undefined and in others very crisp." Not very. It's only crisp if it is perfectly vaccuumed and no one steps on it. Footprints or any kind of movement marks push the fibers the opposite way and appear a different color as well. I agree with Melissa. It's definitely more muted. I think the pattern would only be crisp if you were looking down on it from the ceiling. It is muddy and undefined, a regrettable purchase. "What shade of grey/silver ? ....light, medium, does the silver look dark on the floor ? thank you, m"
Light silver. Very pleased with the colors. Not too dark or light. The silver is very soft and design does not jump out visually-very subtle. Looks light on a med gray wood floor. Very pleased with the color. Not to light or to dark. "Will you get more of this rug?" Hello JC, items are restocked as they become available; however, we cannot guarantee an item will be restocked. Thank you for shopping with us. Been struggling to find a pale GRAY that wasn't "bluish" in color. I truly hope this works for my application. I am a vintage fan, and love old repurposed furniture. 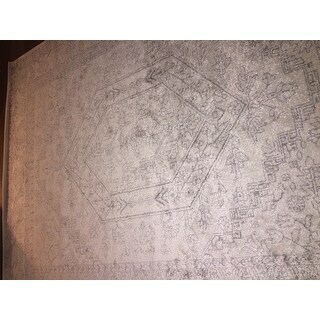 This carpet will be perfect underneath my chalk painted diningroom furniture!